This entry was posted in Running and tagged Boston, Marathon, Training on May 3, 2015 by Natalie. This entry was posted in Running and tagged Boston, Marathon, Training on April 29, 2015 by Natalie. This entry was posted in Running, Running Pregnant and tagged 10K, running pregnant, Training on October 31, 2014 by Natalie. 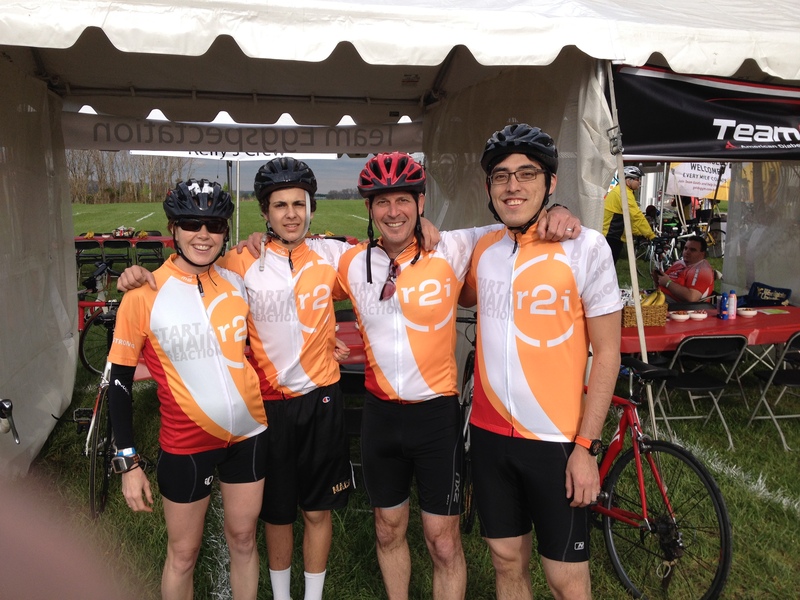 On May 3 I joined colleagues and a few hundred other cyclists in Howard County for a challenging but totally gorgeous ride. After four months of as much training as I could, I decided at essentially the last minute to ride 32 instead of 22 miles. I felt ready. No doubt it was the right decision. This event was the first athletic event I’ve done that wasn’t a race and I can genuinely say it was just as rewarding. Part of the reward was in being part of something bigger. And part of the reward was the feeling of accomplishment at the end. Riding in packs is always a hair intimidating at first; a lot of people in a small space going at a relatively decent speed means you have to really have situational awareness of your surroundings and confidence in your ability to control your bike. We headed out around 8:30am on a brisk but beautiful morning with a group of about 100. Our team from r2i was divided between a 32 mile group and a 10 mile group. Within the first three miles things started to space out which was helpful as we were on roads without much shoulder, but at that hour also without much traffic. By mile 10 or so my co-hort had taken off ahead of me and I kept up as best I could. The course was pretty darn hilly–much hillier than I expected–so while I could cruise at 25mph downhill there were plenty of uphill moments where my GPS read a depressing 6mph. We reunited at the well placed rest stop at mile 21 and finished the rest of the course together. At 21+ weeks pregnant during the ride, I was much more comfortable than I anticipated I would be. Most of my training rides had been midday while our son naps and I think midday pregnant work-outs are just not for me. I’m full and bloated and generally uncomfortable. So doing this ride at the start of the day was perfectly enjoyable. As we made our way up the final hill within site of the finish line we could hear the music and festivities of the finish line. The volunteers of the day made for an awesome “welcome back” committee and the music made all the difference for having a powerful finish. 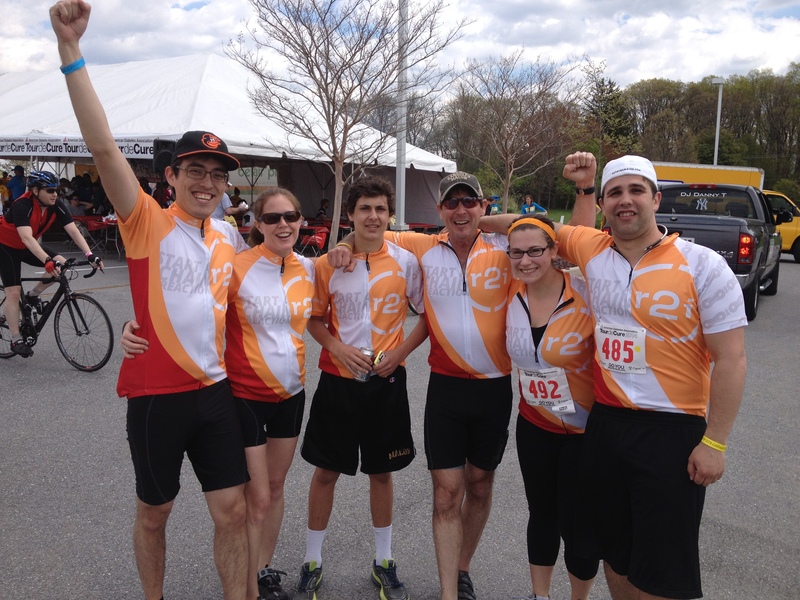 We reunited with the rest of our r2i team for a group photo and to celebrate the accomplishment. This event was also one of the first where I’ve ever had to seriously fundraise prior to the event. I set a goal for myself of $500 which would go toward our team’s goal of $5000. I ended up raising $706 and am incredibly grateful to each person–family and friends–who donated toward my ride and the cure for diabetes. Our team made it 88% of the way to our goal which is darn impressive in my opinion. I’m proud of what we did as a team and I am humbled to have been able to ride for a cause. This entry was posted in Healthy Living, Running Pregnant and tagged cycling, Training on May 4, 2014 by Natalie. This entry was posted in Running and tagged core, strength training, Training, work-out on March 2, 2014 by Natalie.